This is a lovely time of year in the British countryside: the lanes are rife with daffodils around us, blossom is appearing, the hawthorn is already budding in profusion and lambs are chasing each other across the fields. With week after week of glorious sunshine it’s been a great time to get out sketching, and as you can glean so much from engaging the locals I stop to chat whenever I can. The previous weekend I met a farmer who simply wouldn’t stop talking. “Had triplets last night,” he said, matter-of-factly. “Really?” I half-queried, trying to keep a straight face. “Trouble is, only got two t-ts.” I raised my eyebrows, unsure of who or what he was describing. “But I got the old ewe to give one away, with a bit of persuading.” At this point I felt we were probably discussing the problems of the mother sheep, and turned to my sketchbook. 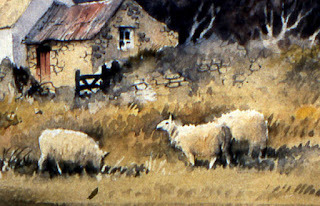 Sheep can add life to a scene and are not that difficult to draw. I rarely give them four legs as it can appear over-crowded in a painting: three is quite sufficient. I sometimes give white-faced ones a black head to make them stand out, otherwise paint in a darker tone around them as I’ve done in this part of a watercolour composition. When out I do photograph them, but enjoy drawing them as it can usually convey a better sense of movement and dynamism – not that the sheep is especially dynamic! This weekend I was again out on the hills when several sheepdogs raced into view around the sheep. Quickly I reached for my pencil as the farmer drove into sight in his land-rover. Alas, the dogs were ignoring the sheep, and simply hurtling past. I had hoped to get an interesting round-up scene. Even the farmer didn’t stop, just hurtled past with a wave, so I missed that one. You can’t win them all, I guess, but you have to keep trying. It’s all part of the fun…….